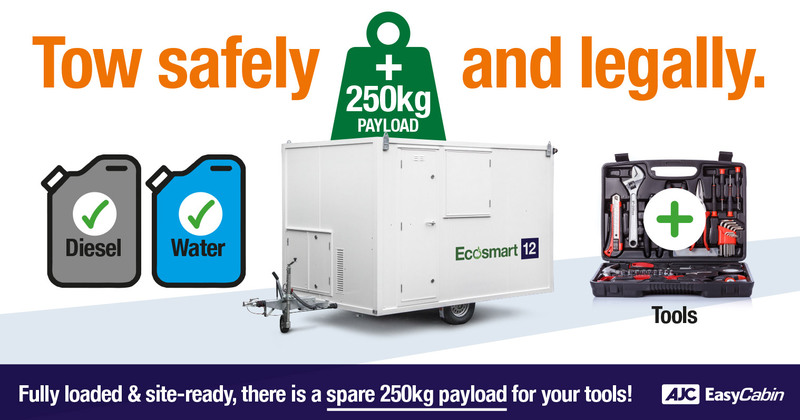 Fully loaded & site-ready, there is a spare 250kg payload for your tools! 05 Jun Fully loaded & site-ready, there is a spare 250kg payload for your tools! EasyCabin gives you the confidence that you are towing legally and safely. The EasyCabin Ecosmart 12 has a payload of 250kg. Plenty of weight allowance to safely and legally tow all your tools etc. in the cabin. The UK’s highest payload on a 12ft welfare unit, that includes water and fuel. Take a look at the Ecosmart 12 – easy to move – easy to use welfare cabins. Book a demo now, we’ll come to you.